HotelPlanner.com has resumed racing after diverting to Port Elizabeth to drop off round the world crew member, Greg Adams (59), who had a suspected fractured arm. The team was met by Clipper Race officials, Tom Way and Sarah Hoare, in Port Elizabeth in the early hours of Sunday morning and Greg was safely disembarked and transferred to hospital for X-Rays. Leg 3 crew member, Steve Hathaway (56), has also been transferred to hospital after injuring his finger on Day 1 and will not be resuming Race 3: the Dell Latitude Rugged Race. We wish Greg and Steve all the best as they receive treatment for their injuries. Skipper Conall Morrison is happy with the situation and has also welcomed six new crew members onboard from Greenings who had run aground earlier in Race 3. IMAGE: Some of the Greenings crew members preparing to join HotelPlanner.com (Jemma Cowley out of shot). Earlier in the day, HotelPlanner.com had ceased racing, by turning its engine on, at 0150 UTC in order to make its way in to Port Elizabeth. Since the crew transfers have taken place, the team has now returned to the point where it turned the engine on and resumed racing to Fremantle at 1102 UTC. We would like to place on record our thanks to all parties involved in the safe transfer of Greg and Steve to hospital, as well as the transfer of Greenings crew members onto HotelPlanner.com including Ian Gray (Station Commander) and his team at Unit 6 National Sea Rescue Institute (NSRI), Alan Straton (Algoa Bay Yacht Club), John Tudorhope (Algoa Bay Marina) and Steven Bentley (V&A Waterfront) for putting us in touch with relevant contacts at Port Elizabeth. 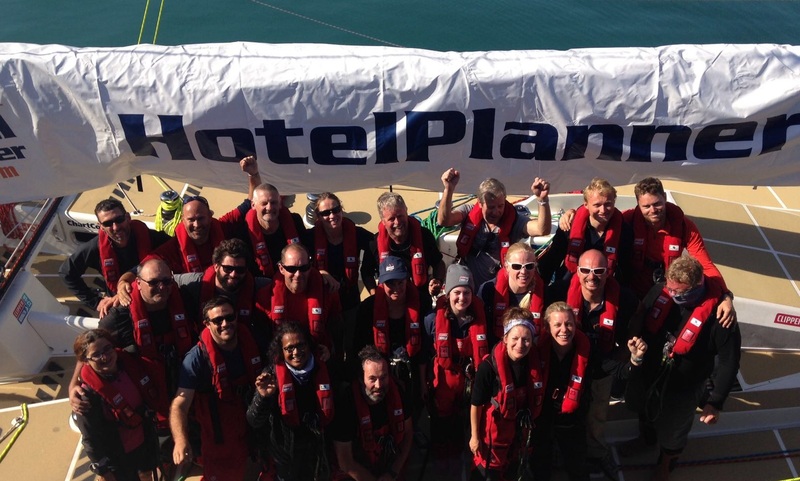 We would also like to thank the HotelPlanner.com crew for handling this situation admirably and for making their new crewmates feel very welcome.